WELLFLEET — Charlie Marcus, 12, and his father Peter collapsed in their Eastham hotel room Monday night. They’d flown out from Los Angeles over the weekend specifically to go out on patrols with Massachusetts Audubon’s Wellfleet Bay Wildlife Sanctuary volunteers, rescuing endangered tropical sea turtles that succumbed to the first cold water temperatures of the season and washed ashore. Turtle stranding season is here, with 80 sea turtles rescued off Cape Cod Bay beaches over the past week, and brought into the sanctuary for their initial treatment before being shipped to the New England Aquarium turtle hospital in Quincy for rehabilitation. Monday proved particularly tough. The winds turned bitter cold and blew hard out of the southwest, and the two walked the beaches, picking up helpless turtles and transporting them back to the sanctuary, where they also assisted staff and volunteers who were measuring, cataloging, and taking the first steps in treating the first big pulse of strandings this year. “There was so much life and death all around us, we were exhausted,” said Peter as the two headed out Tuesday afternoon with volunteers Barbara Brennessel and her husband, Nick Picariello, of Wellfleet, for a mile-long patrol from Great Island to Duck Harbor. “It was really cold and windy,” Charlie Marcus said. Every year, hundreds, sometimes thousands of these cold-blooded sea turtles, Kemp’s ridley, green turtles, and loggerheads, become trapped in Cape Cod Bay in the fall, and either cannot find their way out or leave too late and hit a wall of cold water as they approach the open ocean and turn back to the fleeting warmth of the shallow bay. They attempt to shelter in place, waiting out what they may believe is a passing cold front. But with time and the deepening cold, their metabolism slows down and muscles no longer function. They surface, immobilized and at the mercy of the wind that either blows them toward the shore where they suffer from exposure to the biting winds, or out to sea where they eventually die. 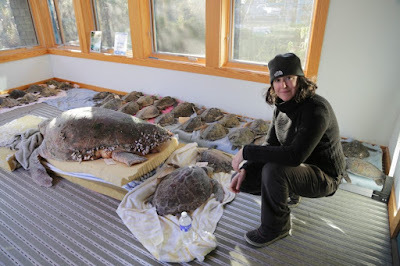 Hundreds volunteer every year at the Wellfleet sanctuary for the turtle patrols and rescue work. Brennessel, a retired Wheaton College professor, found it was a natural extension of research work she’d done on terrapin turtles at the sanctuary, although her motives transcended the dispassionate approach of a scientist. Charlie was 5 when he read about the diamondback terrapins — which are endangered in Massachusetts, but not listed federally, and live in the brackish marshes from Cape Cod to Texas. He was moved by the Wellfleet sanctuary’s efforts to improve their chance for survival by improving habitat, protecting nests and raising hatchlings for eventual release, and started sending donations. This year, for his bar mitzvah charity project, he decided to focus on sea turtles. Peter Marcus, a Los Angeles intellectual property rights attorney, was born in Brooklyn and lived in the Berkshires, but spent many childhood summers in Wellfleet. The two decided to return to the Cape to experience turtle rescue firsthand. “Understanding the full spectrum of life is something I hope to teach my children in a way they don’t teach in school,” Marcus said. “He’s got that empathetic gene,” Marcus said of his son. All sea turtle species are listed under the U.S. Endangered Species Act. “They’ve been here longer than people and we want them to stay that way,” Charlie said. 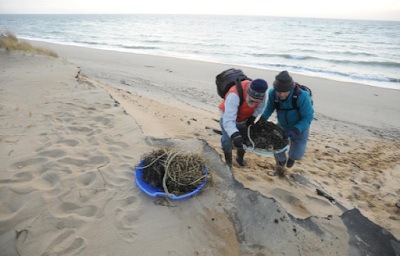 Why Are Endangered Sea Turtles Showing Up Cold and Seemingly Lifeless on Northeastern Shores? A Kemp’s ridley turtle lies motionless, seemingly dead, along the high tide line on Skatet Beach. It’s exactly as Bob Prescott predicted. Prescott, the director of Mass Audubon’s Wellfleet Bay Wildlife Sanctuary on Cape Cod, bends down to move the turtle out of the reach of the cold ocean water, and covers it in seaweed to shield it from the wind. It’s 6:45 a.m. on November 24, 2016. When Prescott looked at the weather report the previous night, he saw that one of the year’s first winter storms would soon be descending on New England, crossing the Northeast from Buffalo to the Eastern coast and bringing with it icy temperatures, lake effect snow, and chilling winds. That’s when he knew he would be up early in the morning, walking the beaches of Eastham and Orleans, in search of turtles. The middle of October marks the beginning of a dangerous “cold stun season” for sea turtles caught on these Northeastern shores. Hundreds of turtles, mostly Kemp’s ridleys, wash ashore each year once ocean temperatures sink to 50 degrees F. The geography of the Long Island Sound and the curving Cape Cod Peninsula create a barrier to turtles trying to swim south, away from rapidly cooling waters. Before they can flee, icy waters often stun the cold-blooded reptiles into a paralyzed state, leaving them at the mercy of the tides, currents, and wind. Fortunately, Prescott has cold stun stranding predictions down to a science. Using years of wind and stranding pattern data, he understands how turtles are pushed by wind to specific beaches along the inner arm of the Cape Cod peninsula. But it wasn’t until recently that experts were even aware of the mass turtle strandings that occur across Northeastern shores. Turtle bones from archaeological digs suggest the phenomenon has been occurring for hundreds of years, possibly since the formation of the Cape. Whether turtles disappeared at some point from Northeastern waters or we simply were unaware of their presence remains unclear. But in the past 30 years, scientists have been stumped by a sudden upsurge in turtles found stranded, motionless and on the brink of death along these shores. Read more at Smithsonian.com HERE. AGAWAM, Mass. (WWLP) – Workers from Eversource, tree service contractors, and environmental consultants, along with biologists from the Massachusetts Division of Fisheries and Wildlife gathered on the pathway under the high tension power lines on Moylan Lane in Agawam. “Eversource has more than 2300 miles of transmission rights-of-away in the three states that we operate, more than 600 miles here in Massachusetts. So we have a big stake in making sure that their habitat is protected and we take our role as an environmental steward very seriously,” said Frank Poirot of Eversource. “Turtles can often get killed by machinery and heavy equipment so our goal is to train their staff as they’re working through these rights-of-way so they can avoid that direct mortality. Pick the animal up and move it to safety and continue on with the project,” said Mass Wildlife Endangered Species Biologist David Paulson. 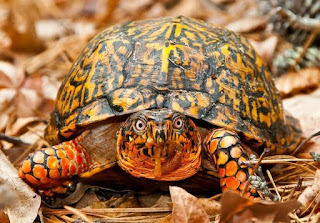 The Eastern Box turtle and the Wood turtle commonly live and breed along transmission rights-of-way. Every year Eversource holds the training for those who work along those paths. It’s not easy keeping up with box turtles. Dr. Ray Clarke, a scientist who spent three years tracking the land-roving reptiles through the woods of Truro and Wellfleet, learned that first-hand. “It’s hard work. You’re out in 80 to 85 degrees, alone. It's fine going through the pine oak forest. But when you enter the wetlands it can become impenetrable. Once I had a fall over muck — the log broke and I started to sink in. Brier can tear right through your jeans. Cell phone service is spotty,” Clarke says. His study focused on how the right-of-ways around the Outer Cape’s power lines might be affecting the breeding habits and survival of Eastern box turtles, which are listed as a species of special concern in Massachusetts. A Truro resident, he’s received degrees from McGill and Yale universities and taught ecology and “many kinds of biology,” including evolutionary and marine, at Sarah Lawrence College, where he’s now a professor emeritus. He wanted to avoid retirement’s shock with an ongoing science project, so he brainstormed with Robert Cook, Cape Cod National Seashore ecologist, and initiated a study to appease his curiosity about the relationship between power lines and box turtles. He was correct. From 2011 to 2013, in May and June, he captured 18 females under NSTAR/Eversource power line right-of-ways from South Truro to North Wellfleet. As the turtles lay only four to six eggs, the nests were very hard to discover, so he qualifies the accuracy of whether they were nesting or not: "I only saw one turtle laying eggs, but the pattern of females moving to the right-of-way during the nesting season is pretty strong circumstantial support for that view." With grants from the Cape Cod National Seashore and help from Lori Erb, who was surveying turtles statewide for the Mass. Natural Heritage and Endangered Species Program, Clarke placed radio transmitters on the backs of adult female turtles, tracking them with a radio antenna. It was a learning curve. “Using tracking equipment was new to me. I'm not a turtle guy. I’m a fish guy.” Describing years of field work, Clarke said he would scuba dive to do population studies of fishes of coral reefs, asking, “How can so many species, hundreds, exist together?” He wanted to understand how they compete and divide up niches, discovering in the process new information which he has published in scientific journals. Clarke’s study suggests, but doesn't yet prove, "a potential for a significant negative impact of the right-of-ways on the long-term health of this population.” Using the “precautionary principal” Clarke advises, “We should avoid potential harm until we know more”— that is, until we know for sure that adult turtles nesting under lines on right-of-ways, as well as hatchlings, are not being run over by utility trucks or suffering illness or death due to sprayed chemicals such as Glyphosate, which the utility company uses to suppress weeds. Clarke adds that the right-of-ways are also inviting to raccoons and other predators that dig up and eat eggs. While the Seashore has the biggest population of box turtles in Massachusetts, Clarke says that because of their ability to attain advanced age — 50 to 80 years and beyond — the turtles may appear to be doing well when in fact, because their rate of reproduction is so slow, any hit to their population has repercussions for a very long time. Clarke says he may write a memoir of his exploits as a field biologist. He is studying how to do that with Rosalind Pace, and his paper on the box turtle study is currently under peer review for possible publication. BILLERICA -- Instead of the chicken crossing the road, why does the turtle cross the road? Actually, the more appropriate question on Wednesday in Billerica was: Who can help a very large snapping turtle cross the road? 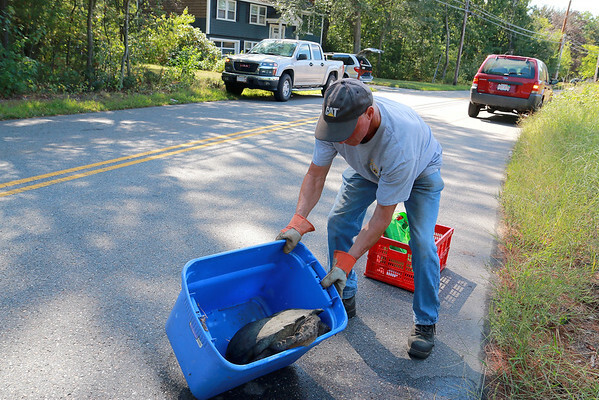 Fred Baker of the Billerica Highway Department was the one to save the day, helping the snapping turtle get across Oak Street. When he saw the turtle, Baker grabbed a neighbor's recycling bin. The heavy-equipment operator placed the turtle in the container and helped it across the street. He survived getting bit by the snapper, but it was close, said Highway Superintendent Ed Tierney. Baker later told Tierney that he "did what anyone would do." With many turtles native to Massachusetts labeled "endangered" and "threatened," it's more important than ever to save them, turtle enthusiasts say. For instance, the Groton Turtle Conservation tries to reduce the high injury and mortality rate of Groton's turtles on roads. This wasn't the first Billerica Highway Department animal encounter. Last week, the department contacted Animal Control because a cat was stuck up in a tree. Animal Control called the Animal Rescue League of Boston, which came out to save the cat. "We do come upon these once in a while," Tierney said, adding that employees and police once helped save six ducklings in a catch basin at the corner of Boston and Lasallette roads. 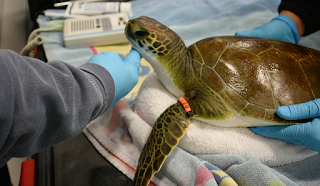 BOSTON (AP) — The New England Aquarium is opening a new exhibit next week that highlights how it takes care of injured sea turtles. Visitors to the interactive exhibit that opens Wednesday can learn how injured and endangered turtles are diagnosed, treated, rehabilitated, and then released back into the wild. Visitors will hear how cold-stunned turtles’ hearts beat slower than healthy turtles after they wash ashore from cold ocean waters. They can see how turtles undergo CT scans, surgery, blood work, X-rays, and treatments with antibiotics, nutrients, and nebulizers. There are simulated respiratory, skeletal, and digestive diagnostic tests that visitors get a chance to try out themselves. The aquarium last fall took care of more than 700 sea turtles that had stranded in the region.